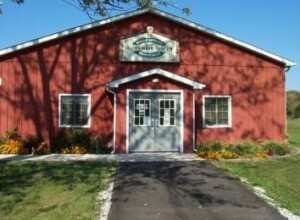 Named for one of the members instrumental in getting the museum built, the Alton Goin Museum sits peacefully in the 33-acre Countryside Park on U.S. 6 in Portage. The Museum was built with community support and volunteers, showing just how much historical preservation means to the people of Portage. As the Historical Society’s collection of antiques and memorabilia grew, so did the need for more space. Until the completion of this new museum, the Trager Farmhouse was used to display exhibits. The Alton Goin Museum was dedicated in June of 2003 and now houses many wonderful antiques, most of them relating to Portage area history. When you come to visit, you can see such exhibits as a miniature model replica of parts of the city, Indian artifacts and reproduced clothing, one of the old Township fire engines, and Portage High School memorabilia. Take a look at some highlights of the Museum’s collection. The Museum also sells informational booklets such as the new one showcasing historic homes in Portage. Stop by and take a look! Hello! I am creating a giant traveling map of Porter County in honor of Indiana’s bicentennial and would like to put your museum on the map. However, I need the latitude and longitude and am unable to locate it. Thank you for any assistance you can give. This will be a resource that will travel to schools, libraries, and museums once it is created on sturdy vinyl. I am also developing standards-based curriculum as soon as this is completed. © 2010-2019 Portage Community Historical Society, All rights Reserved.